The word “conference” gives us the sense of an auditorium, a multimedia system, well dressed speakers and critical facts which are to be discussed. Subsequently, it reminds us the air fare or any other travel fee, hotel bills, conference room charges and other expenses as well. All these phenomena imply that the conference is a well organized secretarial mechanism where the most demanding people gather for a common purpose. With the introduction of the various conference software, the concept of on line conference has successfully replaced the physical setting of the conventional conference. The online conference saves your money as you do not have to pay for travel, hotels, food etc, and all you need to have for being a part of the online conference, is a computer system and internet access. The method saves finances and recourses of your company, as it is not necessary to pay for conference rooms and other highly cost equipments. Less Time Consuming: In a conventional conference, you may need extra time to reach the place and also to come back, whereas in the online conference, all it takes is just a click. You can merely focus on the content of the conference as you do not have to bother about travelling or the accommodation. The organizers have more time to study the facts that are to be discussed in the conference and they also save time in studying the context of the conference and make it effective. Practicability: As the conference has a fixed date and time; you may leave out some of your important occasions and rearrange your schedule in order to participate in the conference. Sometimes you may not be able to be present at the conference due to an inevitable circumstance. As a matter of fact, gathering all the participants to a conference hall at a specific time may not be very practicable. But, the online conference gives the opportunity to participate in the conference irrespective of the place, time, and situation. 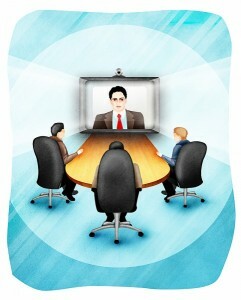 Fewer tasks in organizing: The online conference does not need any other specific physical arrangements except the computer system, internet access and software. Therefore, less number of tasks are to be organized. But in organizing a conventional conference, variety of tasks such as reserving conference rooms, catering, decorations should be planed ahead of time and it needs a good management process as well. Ensures security: All the participants of the conference can log on to the specific website by using passwords and it secures the identity of the participant and confidentiality of the conference. Participants can agree or disagree, vote and make immediate replies irrespective of being condemned by others. Effectiveness: In face to face conferences, the message of the presenter can be missed or confused, as you have to give attention to them at once. But in the online conference, the same is not the case, as the method is more effective and it gives the opportunity to share saved documents, music clips, slide shows, reports and pictures. By organizing an online conference, you can save money, be at the comfort of your office or home and still deal with the business issues in the most effective manner. Previous post: This is What New Digg is all About?